The 2017 Doklam standoff following Indian troops' illicit border-crossing dragged Sino-Indian relations down to their lowest level in decades. Since then, the decision-makers, academic circles and media of the two countries have focused on Beijing-New Delhi relations. After the standoff, the two sides deepened their understanding of the status and nature of Sino-Indian ties. Partly owing to the standoff, leadership from the two countries realized the hazards in the Sino-Indian relationship. High-level interactions have increased between China and India so as to reposition their relations. There are many controversial issues in Sino-Indian relations, most of them old. They include territorial disputes, the Pakistan and Tibet issues. Although such issues persist, remarkable improvements have been made in the last 20 years. The biggest challenge in ties between the two is that today's Sino-Indian relations do not fit into any international template. China and India are both rising rapidly. Their relations do not accord with their strategic goal of pursuing dreams of major power status. China's strategic indifference towards India and India's strategic sensitivity towards China have always existed. These attitudes are rapidly becoming major obstacles to the development of the two countries. The more they develop, the more serious the strategic anxiety in the other side and the greater the security burden unless positions are addressed and traditional notions of geopolitical competition are abandoned. The recent China-US trade conflict and the US one-sided ban of China's ZTE Corp remind China, India and other countries with dreams of rejuvenation that China and India still need strategic unity in order to reshape the old international political and economic order. 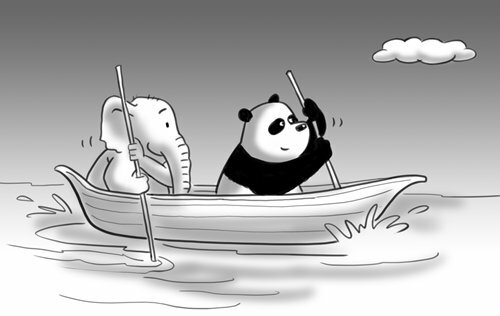 China and India must build a new strategic framework that faces the future. Recognizing the vicissitudes in Sino-Indian ties since 2013, it is obvious that to build a long-term, healthy, positive relationship will take more than various leadership efforts. Academic research and media reports should change at the same time, so as to provide a stable basis for Sino-Indian relations. China and India should set up a bilateral strategic dialogue mechanism. It should be all-round including official, semi-official and nongovernmental mechanisms. It must not only offer a chance for the two sides to understand each other better but also continuously generate positive energy for bilateral relations. China and India should also set up joint scientific research projects aimed at analyzing the origin and influence of the 1962 Sino-Indian border conflict and finding an academic solution to territorial disputes. By forming a joint research group, the two countries can try to reach a consensus on the origin and influence of the conflict. Only by reaching an academic consensus prior to influencing publicity can Chinese and Indian governments truly solve territorial disputes. China and India should promote cultural exchanges. Beijing and New Delhi are each other's biggest neighbor, yet their cultural exchanges occur at a rather low level. Scholars and students of the two countries prefer to go to the US, Japan and the Europe rather than each other. The psychological distance between the two countries is actually much farther than that between them and the West. After all, Sino-Indian relations refer to the relations between Chinese and Indian people. The two countries' governments should take practical measures and adopt policies to promote closer cultural exchanges. In ancient times, religious and cultural personages from China and India made arduous journeys to promote communication between the two countries despite life-threatening conditions. The experiences of Chinese Buddhist monks such as Faxian and Xuanzang are not only everlasting memories in our hearts, but also show us that as the two longest-standing civilized countries in human history, China and India enjoy a profound shared history. More importantly, they show a vision of the future and our historical responsibilities.